The Purple pet bed, isn’t your typical pet bed. This is really a Purple mattress for your dog. I have a purple mattress and I love it, so I figured that my dog would want one too. I mean he has logged countless hours sleeping in the corner of my Purple. Surely, he would love his own and I can finally get back some leg room. Right? Well no, it took nearly 4 months for my dog to even attempt to use it. Perhaps there was a slight odor, or it was too unique. More likely, he was just too attached to the pet bed that he has had since he was a puppy. Forget the dog, use it for a camping mat, seriously! Very unique, your dog may not like it. Purple makes a unique mattress by using a top layer of hyper-elastic polymer. So the purple pet bed includes a 2 inch layer for your favorite pet. Below that layer are 2 layers of polyurethane foam. If you skip to 6:14 on the my video review above you will see that it is basically a smaller version of their original purple mattress, which is around $1,000 for a queen. The cover is where the real magic is. It is designed to be antimicrobial and odor-neutralizing. More importantly, it is moisture-resistant. This means that you have the chance to keep the cover clean from dog drool, but no guarantee. Does your pet need a Purple? 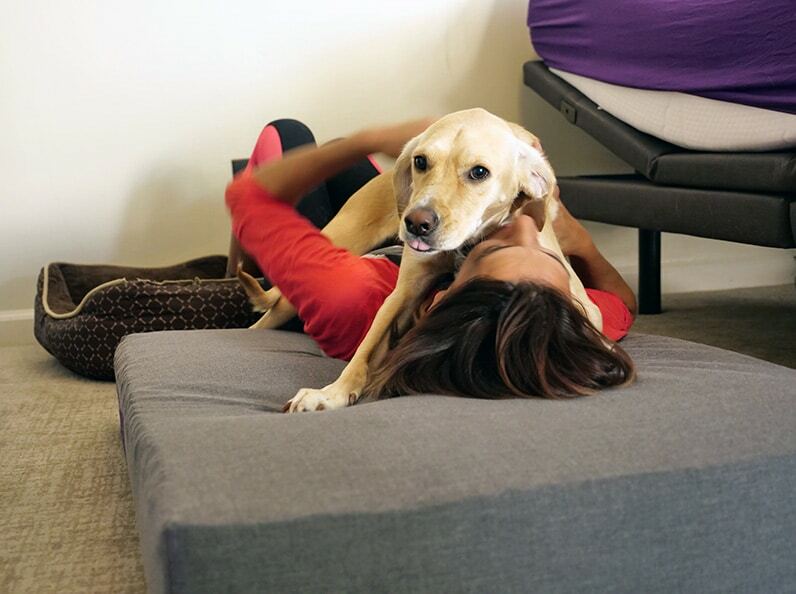 The purple pet bed comes at a steep price, so it isn’t an easy purchase decision. I have had no luck getting my dog to switch out of his old smelly cheap bed, and believe me I have been trying for years. I guess it’s my fault for not just tossing his old one the day I bought a new one for him to try. I’m glad that I stuck with this as he finally came around and he’s now in it just about every time he takes a nap. What size is a Purple Pet Bed? YES, and I have! My dog wouldn’t touch it for awhile, so I tried it out for him. Yes, 100 night trial and a 1 year limited warranty. I would bet that if your dog chews it up that’s probably not covered. Yes, I have taken it off and washed it on a gentle cycle. You will find that it is very easy to remove and replace the cover. I bought it in the summer of 2018, but my dog didn’t start using it until October. How do I buy a Purple Pet Bed?